With a stay in Villa Almira, you will be in the beautiful village of Poste Lafayette, in the north east of the island. While the villa boasts plenty of seclusion in its tranquil neighborhood, you will still be within driving distance of some vibrant attractions. 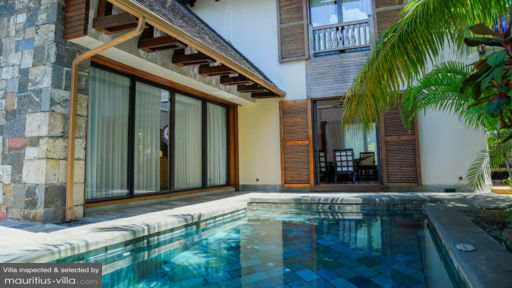 Boasting quintessential Moroccan, Balinese and Mauritian architecture, this villa features opulent furnishings with classy wooden fixtures and an undeniable sense of homeliness. Best of all, Villa Almira places you on a private beach so you can enjoy the gently lapping waves and the warm, silky sand in all intimacy. 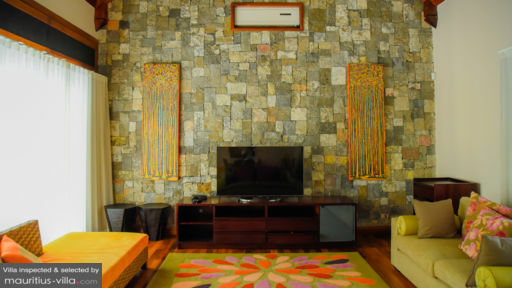 Villa Almira provides a total of three bedrooms to very comfortably accommodate up to six persons. If required, arrangements can be made to accommodate an infant below two years old. 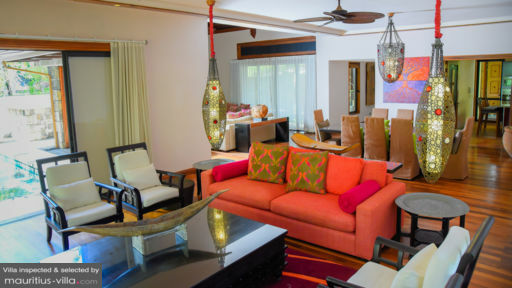 If you’re visiting Mauritius in the summer, you will be glad to learn that all three bedrooms come with ceiling fans and aircons. With a stay in the master bedroom, you will be able to enjoy delightful ocean views. All three bedrooms provide king-sized beds, perfect for a good night’s rest. In the morning, step out in your private garden and sink your toes into the dewy grass. With a partial sea view, Villa Almira provides an expansive outdoor space where you can spread out and relax before you start your day, or as the sun starts to sink beneath the horizon. There’s also a sheltered terrace where you can lounge back and relax as you take in the views. Pool and lounge chairs are available, should you wish to work on your tan. Best of all, there’s also a deep plunge pool, perfect for a refreshing swim to cool off after a fun day of touring Mauritius. Gloriously comfortable and relaxing, the living areas of Villa Almira are designed in such a way so as to provides classic home comforts. In the beautifully-furnished lounge, you will find a 50” flat-screen television with English or French satellite channels, Nintendo Wii console, Blue Ray DVD player and even a surround sound system, perfect for when you want to entertain. When you don’t want to eat out, rest assured that the villa also provides a private dining room that can very easily accommodate up to eight diners. If you want to practice those culinary skills, there’s also a fully-equipped kitchen with everything that you will need to prepare your food, including hot plates, oven, microwave, fridge, freezer, coffeemaker with Nespresso capsules and more. There’s also an assortment of crockery, cutlery and utensil sets. Upon your arrival at Villa Almira, you will receive a welcome kit with Nespresso capsules, sewing supplies, vanity set, toiletries, dishwasher capsules, mosquito repellent, salt, pepper, fruit juices and water bottles. Rest assured that you don’t need to worry about cleaning up thanks to the housekeeper. Additional paid services include in-house massages, in-house chef, waiter and more. Not far from Villa Almira is found the public beach of Poste Lafayette, where you can enjoy a variety of nautical activities including snorkeling, kayaking, sea karting or glass-bottom boat rides. It is also possible to book catamarans that will take you further out behind the coral reefs where you can explore the tiny islets that surround Mauritius.